Capri pants are women’s fashion staple since decades. It is even popular as the sleepwear. 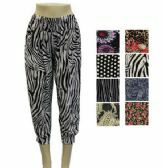 Blue Star Empire presents a huge collection of wholesale women’s Capri pants and bottoms at attractive prices. 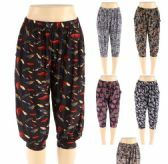 As a leading supplier and distributor, we offer you a wide selection of Capri pants in trendy and attractive styles. 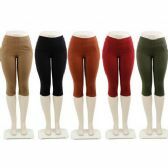 Our collection also includes an unparalleled selection of women printed pants and jeans in bulk that will flatter your body as well as your wallet. 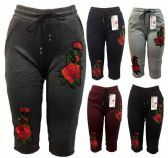 Whether you are looking for a pair of designer jeans, causal or comfy pants to get relaxed at the weekend, you will find the perfect pair of pants from our beautiful range of wholesale capri pants. When it comes to buying women’s plus size Capri pants and bottoms, you don’t have to sacrifice fashion for money. Our big inventory for pants allows you to find exactly the one you are looking for at affordable prices. We also sell wholesale men Capri and pants at unbeatable prices.